Dickens and one of the younger woodchucks sharing a moment. 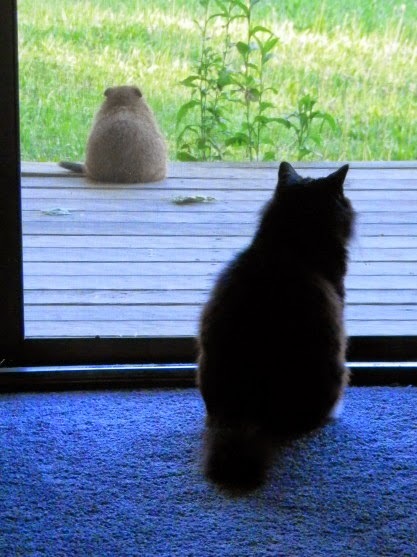 They are less than 8 feet apart, separated only by the screen door. Dickens frequently sits on my desk and watches the woodchucks playing on the porch. 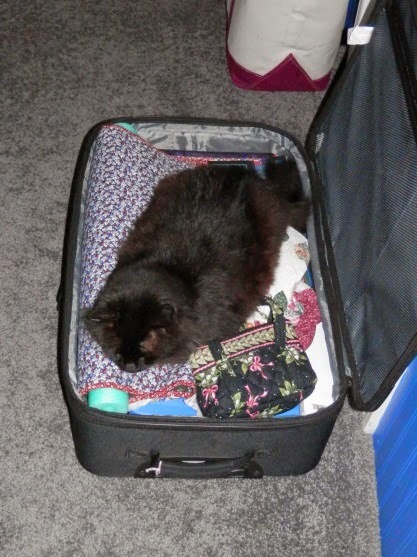 As I was packing for Vermont, Dickens decided that he should help--and maybe stow away! 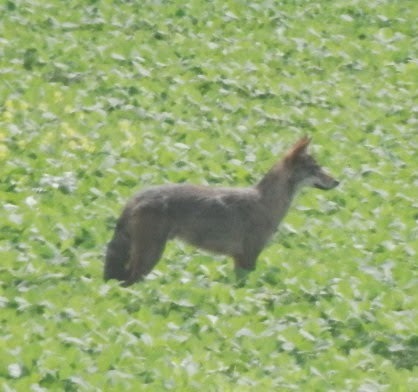 And several times over the past few weeks a gray fox has been visiting. He comes about 10 feet from the house and seems to be looking for the woodchuck family members. They always sound the alarm and are well into their tunnels and under the porch. The gray fox is very regal looking--what a surprise to look out the window and see him! Finished hand sewing the binding on another small wallhanging today and have been writing instructions for a new machine piecing skill builder class. That's it for tonight! Tomorrow? Another adventure! 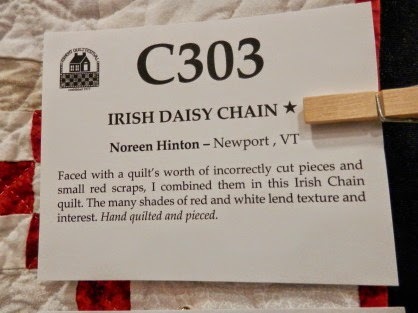 There were lots of great quilts at the Vermont Quilt Festival, but I think this may be the last post about them, at least for now. This piece was just breath-taking. Ann Feitelson was the talented maker. The play of lights and darks was eye-catching. Notice the fussy-cutting of the striped fabrics. 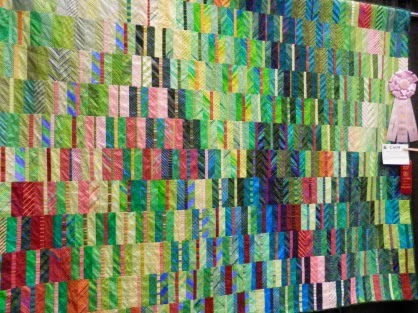 And another shot of the whole quilt. 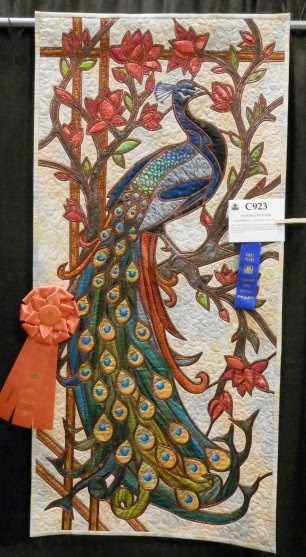 This was Gerald Roy's Judge's Choice, as well as winning a red ribbon in its category. I've been finishing some bindings and doing a bit of prep for upcoming classes. Yesterday I rode a different horse--a very tall (16.3 hands) Warmblood. Can we say nose-bleed from the altitude. I did okay--until I remembered I had to still get off! It was uneventful, but a long way to the ground! Sounds like I may be riding him (Derek) for a while. Managed to do a posting trot twice around the indoor arena without breaking gait or stopping--that's really good for me! For those of you who are shaking your heads wondering what I'm yammering on and on about, just smile, nod and think, "Good for her". Your eyes can even glaze over a bit--I understand. Okay, that's about it for tonight. P.S. I am listening to Ghost Ship by Clive Cussler. This wall hanging is just too cool! 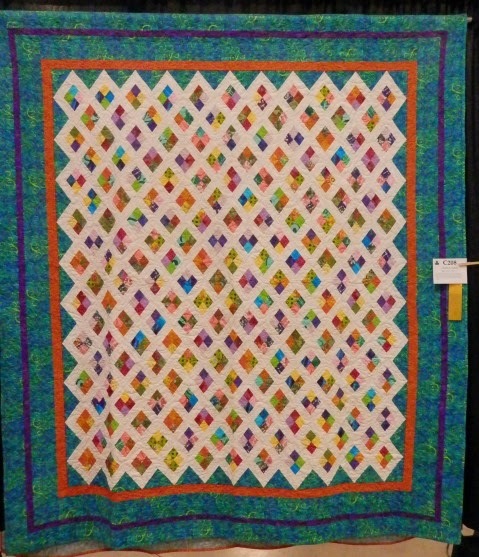 Anne Kaufman, of Montreal, Canada, is the maker of this stunner from the Vermont Quilt Festival. 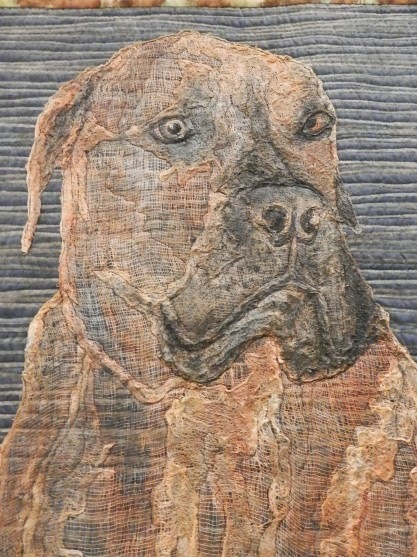 "Leo, Le Mastiff" is an original design, with the dog made of cheesecloth! Doesn't he look real? Here's a close-up. The blue ribbon was well-deserved. Congratulations, Anne! In other breaking news, I added a gadget to the right sidebar so that you can sign up to get email alerts when I publish a new post. You will be asked for your email address, then taken to a pop-up screen where you will be asked to type in the letters you see in a box. They are random letters, but not all squishy and hard to read. This will make it easier to follow my blog. I've spent the day doing housekeeping chores. Laundry, including two loads of batiks, vacuuming, blah, blah, blah. I've been cozying up to my iron for part of the day and working on hand sewing a binding in between. P.S. I am listening to Black Horizon by James Grippando. P.P.S. Be sure to visit Piece O'Cake blog (on the sidebar) and read about "taking care of the girls". Be sure to watch the video and click on the link. You'll be glad you did, for a number of reasons. 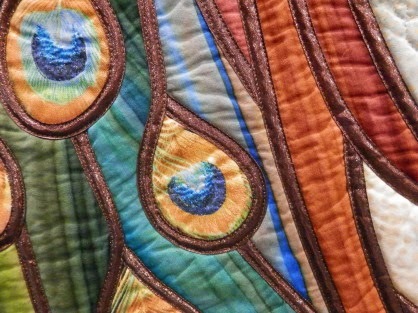 Two more stunning quilts. First is from Laura Clements. 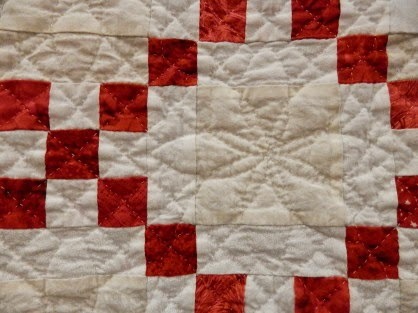 The piecing was excellent and the quilting designs added movement. And an impressive collection of Liberties! 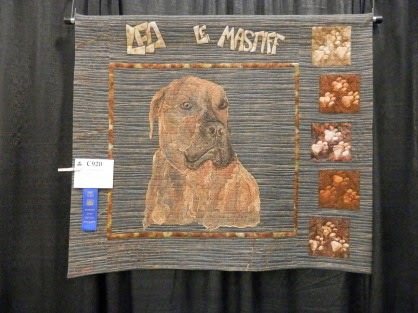 Colette Dumont did an exceptional job on this wall hanging. Metallic leading perfectly sewn, and the corners and points turned sharply. Just stunning to look at! 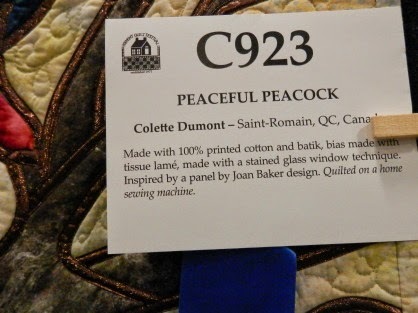 Colette's quilt also won "Best Quilt Outside the USA". Well deserved. A close-up of the impeccable workmanship. Great job, ladies! Both quilts invited viewers in for a closer look. P.S. I updated my website for upcoming classes. www.sharonstroud.com under schedule. 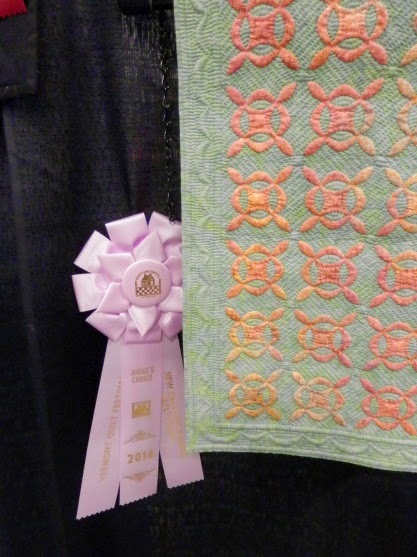 In addition to the ribbons awarded during the judging process, each judge was able to choose one quilt to honor with his/her judge's choice ribbon. There are no restrictions or guidelines for these ribbons; it truly is the judge's choice. 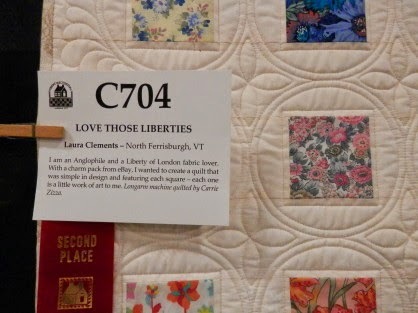 There were many fine entries at the Vermont Quilt Festival and it was difficult to choose just one for special recognition. But this one spoke to me...and here's why. Megan Farkas started with an idea and ran with it. This miniature took a purple (highest) ribbon, Best Miniature ribbon and Judge's Choice. 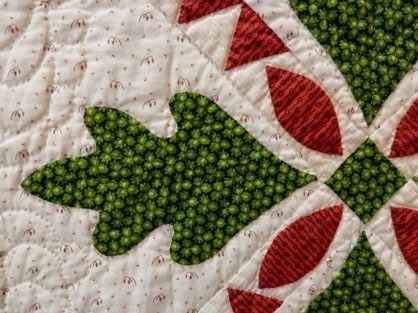 The rosettes would pretty much cover the entire quilt if they were all pinned to it! Hand quilted and hand appliqued. 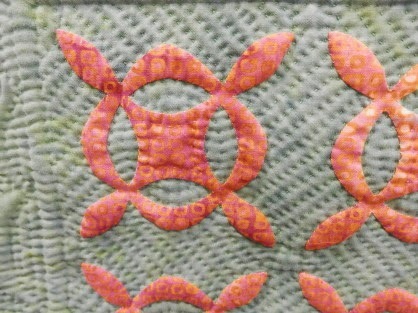 A close-up of the invisible applique and of the quilting stitches. 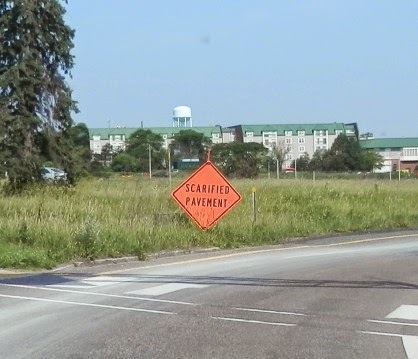 The stitches were even front and back. The backing is muslin, so the green thread really looked beautiful. 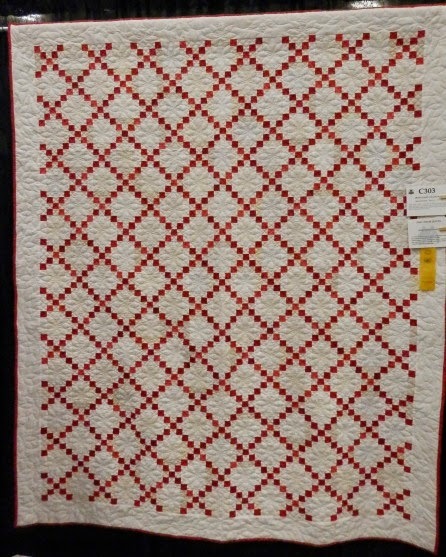 The amount of quilting was evenly distributed so that the entire piece lies flat. 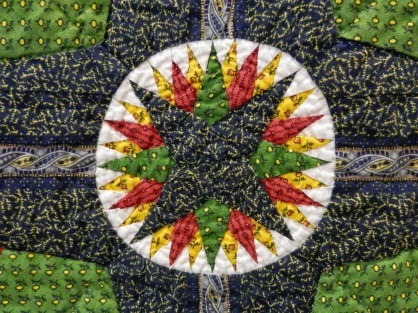 Notice the circle quilting within the reel applique. 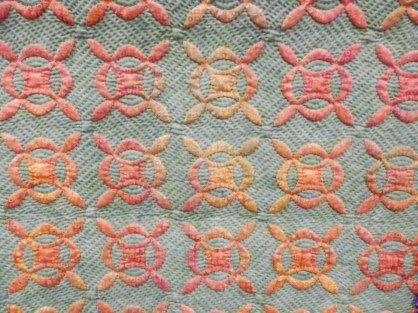 The areas that have not been quilted look like they have been padded (scallops in border). The edge finish was flawless. Megan, this truly is just superb; congratulations! 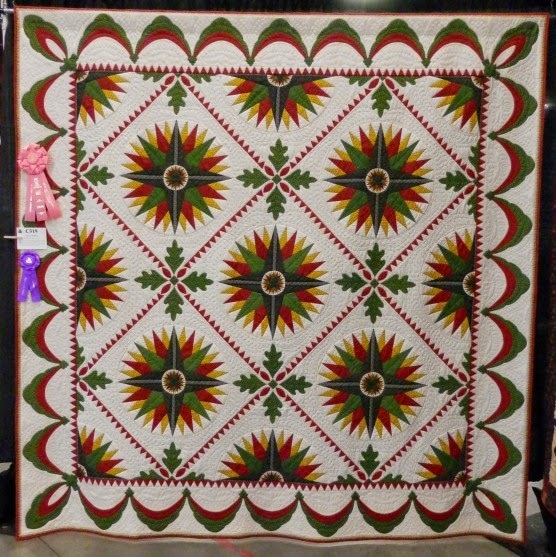 While visiting another blog last night, I was pleased to see pictures of your Sakura II: Picnic at Naruko quilt featured from the Shipshewana show. You can check this out at www.fabrictherapy.blogspot.com under Shipshewana 2. Everyone should check it out--just stunning. P.S. I am listening to NYPD Red 2 by James Patterson, and I just finished reading Top Secret Twenty-One by Janet Evanovich. It lasts less than 3 minutes, but it made me smile and feel very patriotic! Happy Birthday, America! The greatest country ever. P.S. The Vermont journey continues tomorrow. 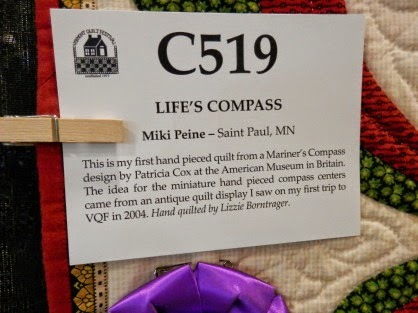 Miki hand-pieced this stunning Mariner's Compass quilt. 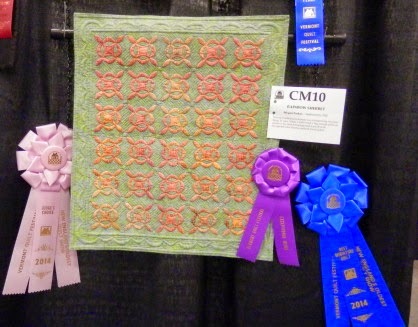 It won a purple ribbon (the highest) and the Best Hand Quilting award (done by Lizzie Borntrager). Let's take a closer look. A feast for the eyes. 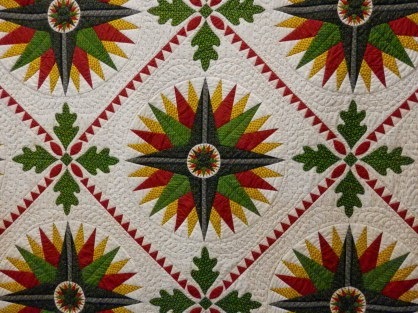 Precision hand piecing, beautiful applique, and stunning hand quilting. These are the centers of the larger compasses. Figure about the size of a closed fist. Absolutely astounding! It was a privilege to see this quilt in person. Congratulations, Miki! 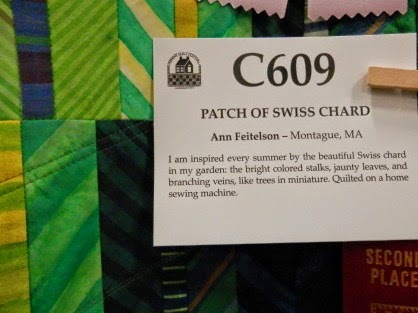 The following pictures were taken at the 2014 Vermont Quilt Festival. 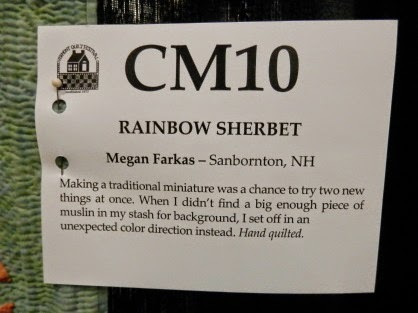 The first picture in each series shows the maker's name and the blurb written about the quilt. 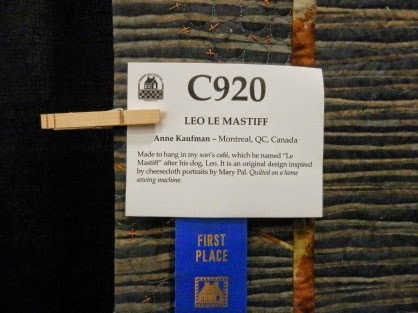 I'm sure there were more quilts that students in my classes had entered in the show. Unfortunately, unless they told me about them, I didn't put faces, names and quilts together. As judges, we don't have access to names, stories, etc. while judging. 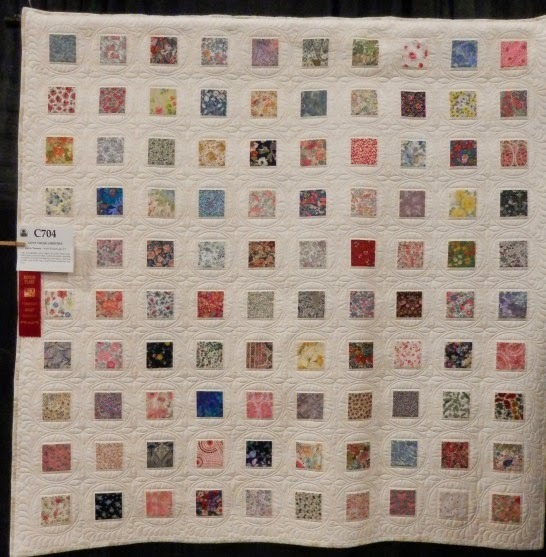 So, if you had a quilt in the show and you were in one of my classes, my apologies for not making the connection and getting pictures. Noreen took my hand quilting class on Thursday. She is quite excited to try the technique on her next quilt. She did a great job on this stunning red and white beauty. Penny took applique classes with me and was just delightful. 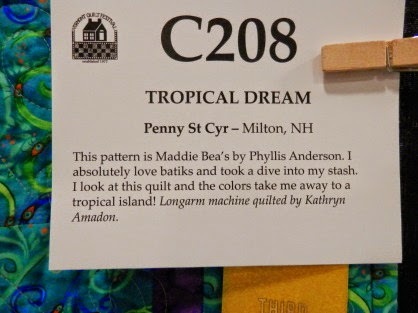 Her quilt definitely looks like the tropics! 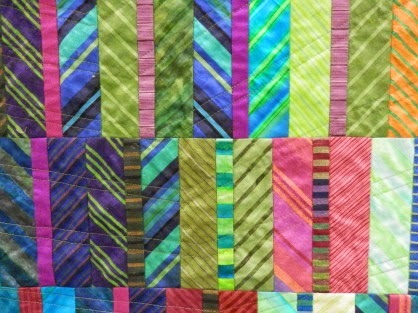 And this is just the beginning of the quilts I have to share with you! 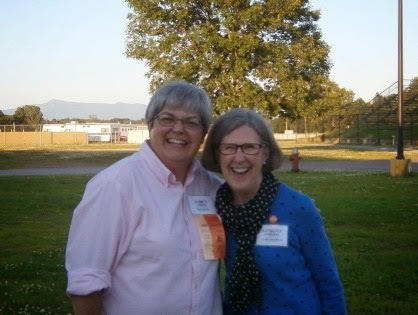 Congratulations, Noreen and Penny! Well done! On Wednesday night after the awards ceremony, on my way to the reception, a voice called out my name from behind me. A lovely lady came up to me and said she followed my blog! I was so excited! I asked her if I could have someone take our picture as this was the first time this had happened. One of my teaching angels, Ellinor, is her friend and was walking with her and did the honors. 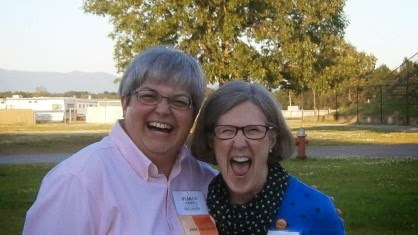 Kathleen L. from Massachusetts was just too much fun! Can you tell?!?!?!? Kathleen, thank you so much for following the blog and for taking time to tell me. 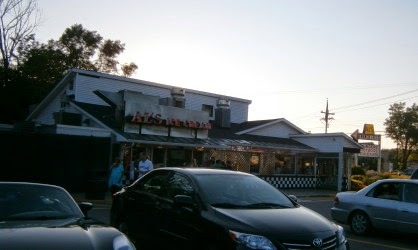 One night for dinner I found Al's French Frys (yes, that's how it is really spelled). 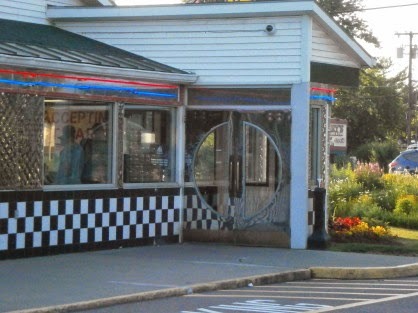 It's kind of a '50s diner with chrome and red and white decor. Food was okay, but the music was great. And what's not to love about this door. 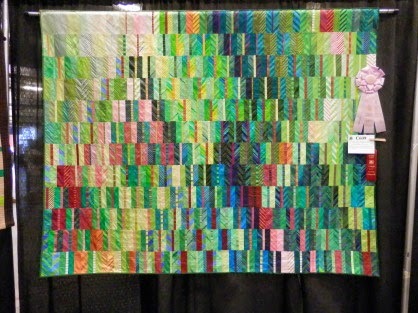 Next up, pics of quilts and lots more. It was a great trip. P.S. I just finished Refusal by Felix Francis and am listening to Worthy Brown's Daughter by Phillip Margolin.